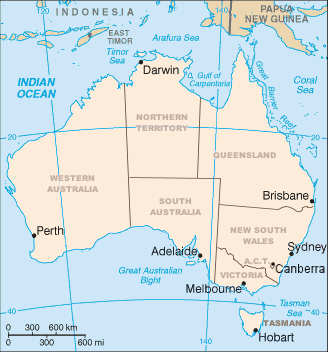 Australia (/əˈstreɪliə/, /ɒ-/, /-ljə/), officially the Commonwealth of Australia, is a country comprising the mainland of the Australian continent, the island of Tasmania and numerous smaller islands. It is the world's sixth-largest country by total area. The neighbouring countries are Papua New Guinea, Indonesia and East Timor to the north; the Solomon Islands and Vanuatu to the north-east; and New Zealand to the south-east. Australia's capital is Canberra, and its largest urban area is Sydney.